Parappa the Rapper’s Japanese box art. We are huge fans of the original PlayStation and that is mostly due to the massive range of games that came out for it and the sheer diversity of the titles on offer. This was a different time where games weren’t as homogenised and creatity wasn’t crippled by the huge budgets that games have now. 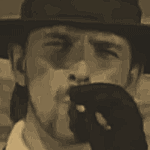 So developers were able to express themselves a lot more and that was seemingly encouraged by the bigger publishers. Parappa the Rapper is one such game. 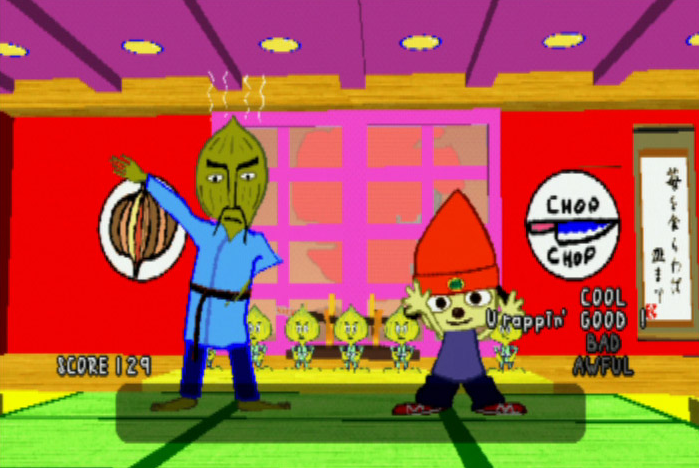 In these days of realistic military shooters, generic driving games and endless sports titles, it’s hard to conceive of a game like Parappa getting a full release. Especially a first-party release from Sony. 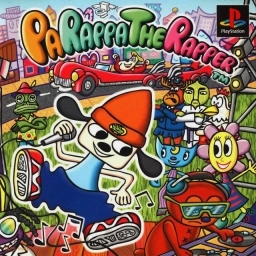 The game tells the story of Parappa who is a two-dimensional dog who raps. All the characters are flat but within a colourful three-dimensional world. It was an innovative look back in 1996 and it is still striking today as it hasn’t really aged. Sure, the edges are a little jagged as you’d expect but Parappa the Rapper always had a rough charm to it. Karate lessons with an onion. The story, as you might expect, is insane. You play as Parappa who is trying to win the affections of a female sunflower called Sunny Funny. Unfortunately, he’s a little awkward and broke and finds it hard to impress. However, his motto is ‘I gotta believe’ and whenever he’s in a jam he falls back to what he does best. Rapping. After watching Joe Chin, a richer dog with an impressive chin, try to woo Sunny Funny, Parappa decides he needs to get a little tougher and so enrols into karate school where he is taught by a teacher with an onion for a head. The Sensei teaches you by rapping his lesson as an indicator moves along the top of the screen, telling you what buttons to press and when. From this point the action is standard rhythm-action fare with you pressing the right buttons and the right time in order to stay in the game. Your performance is rated and if you do well, you keep going until you beat the stage. Bad performance is reflected brilliantly though as the music tracks and the visuals get darker. After you learn karate, you then learn to drive (with a female moose teaching you). This stage adds a little more complexity but the rhythm action is much the same. Unfortunately, Parappa crashes in the next cutscene and has to get his dad’s car repaired. The number one ruler of the seven seas. At this point, the rapping gets real as they say. 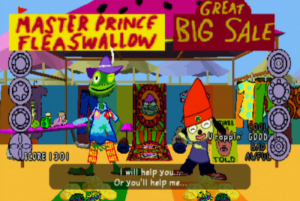 Parappa heads over to a flea market to make some cash under the auspices of a reggae frog. The flow on this stage is a lot more complex rhythmically, despite the slower pace of the track. The tempo increases on the next stage as Parappa attempts to bake a chocolate seafood cake while watching a gangster-rapping chicken TV chef (who brilliantly leaps out of the TV and gets in your face if you perform badly). At this point the game’s difficulty also increases and you can easily fail the stage. It’s worth it just to see the chef’s angry reaction. Of course, eating a chocolate seafood cake is a pretty bad idea and Parappa soon ends up at a public toilet where he has to rap off against all four previous teachers in order to jump the queue. I tend to play this stage badly. Not because of the difficulty but rather because the ‘dark’ version of the track has a wicked bassline. It’s a fantastic stage in its own right though. Even if it ends with Parappa taking a dump and saying ‘ahhh this is life’ for some reason! Angry chicken and TV chef. Cheap, with her Wu-quality flows. 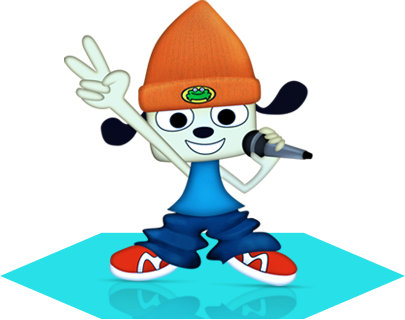 With his life now in order, Parappa takes Sunny out on a date (to Club Fun) and ends up taking the stage with an old-school MC (that’s a spider or something) and has a tricky final rap-off where he tells the world of his feelings for Sunny. 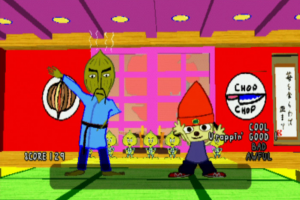 Playing Parappa the Rapper again, more than a decade after I last completed it, has been a pleasure. It still looks as charming as ever and Masaya Matsuura’s memorable soundtrack still holds up brilliantly. If you played Parappa back in the day, the songs are hardwired in your brain anyway. The rhythm action gameplay is simple but deceptively tricky. There were always questions over the accuracy of the inputs and you do have to make some tiny adjustments later in the game but once you learn the tracks, progress is inevitable. Also, if you’re moving back to the PlayStation family after spending the last generation with a 360, this game is a good way to re-learn the joypad. 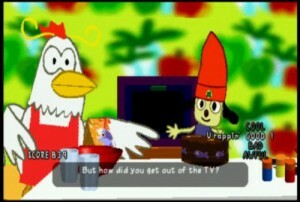 Parappa the Rapper remains a true classic. Where it once innovated, now it shines with a comforting familiarity and a huge dose of charm. The game itself spawned a spin-off title, UmJammer Lammy (which will definitely be getting the Old-time PlayStation treatment from us soon) and a PS2 sequel (that wasn’t as good). It may be asking too much of Sony for a this-gen sequel but we gotta believe. In the rain or in the snow, I got the funky flow, but now I really gotta go!